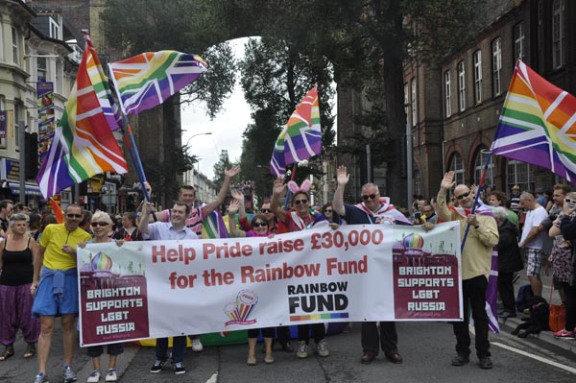 Pride organisers have announced they have smashed the fundraising target they set themselves and raised £43,103.00 for the Rainbow Fund to distribute to LGBT/HIV organisations through their grants programme independently administered by the Sussex Community Foundation. “Every year Pride faces a unique challenge. The large number of participants and spectators that follow the LGBT community parade arrive at the park simultaneously creating an admission crowd that temporarily slowed the admission process down considerably. “We share everyone’s frustrations at the queues that were a direct result of this mass arrival as were the stringent bag searches that were a condition of the licence being granted. “Clearly the long queues at certain points during the day are part of the logistical planning that we will not allow to go unchallenged, and we are already working hard to improve the situation for 2014. “This is a fantastic, fantastic outcome from Pride, which will hugely benefit the local LGBT and HIV community sector. This amount really reflects how successful the event was this year, and I want to personally thank the organisers for the immense effort they put into delivering Pride.